When he got out of prison, in the mid-1960s, he was inspired by Vietnam War demonstrations and by the protest art he read about from other cities — notably the Wall of Respect mural in Chicago, painted by members of the Black Arts Movement. 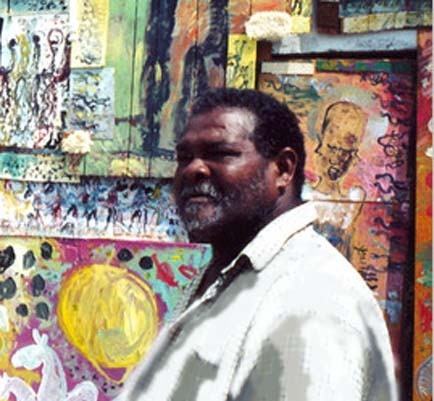 In the early 1970s he created a mural of his own, plastering a wall along a deserted stretch of Overtown’s Goodbread Alley with dozens of his works. The mural drew attention from the news media and from Miami’s art establishment, including an eccentric millionaire, Bernard Davis, who owned the Miami Museum of Modern Art and briefly became Young’s patron, providing him with painting supplies until Davis’ death in 1973. From that time on, Young grew into something of an urban legend, a local celebrity, a frequent interview subject and an art-world star. He spent his entire life immersed in the subculture of Miami’s Overtown district. For over forty-years he created art with scavenged plywood, nails, books, cardboard, Masonite board, broken doors, mirrors and basically whatever he could find. Ironically, just as international fame was finally coming his way, he was on the losing end of ten-year battle with diabetes. He survived with three dialysis treatments a week before a life-prolonging kidney transplant. Despite the fatigue induced by the treatments Young continued to paint. “Everyday,“ Young confided, “ I pray to be great….” His greatness is now acknowledged by a previously skeptical art world. In November 2006 he was the subject of a major retrospective at the Boca Raton Museum. In January 2007 he was the Director’s Choice Artist at Art Miami, and a monumental archway of his work greeted visitors to the Miami Convention center. Even though his work was exhibited in more than fifty museums including the Smithsonian and the Corcoran, and placed in numerous important collections such as the Rubell Family Collection, Young never considered leaving Overtown. “I look at the wildlife (on T.V. )“ says Young, “I see the Monarch butterfly go from here to Mexico and the wild geese go from here to South America. I look at stuff like that and I say that’s the way I want to be, you know. I want to be free.” “He’s painting from the heart…” is how one Overtown neighbor put it. “He’s trying to show people that we need to make a change.” Of his own work Purvis Young has this to say: “I want people to know that I wish there would be peace in the world, and I will paint the way I paint until there is, and then one day maybe I could just hang up my brush and not paint no more.” Purvis Young died on April 20, 2010 in Miami, Florida.